There are a lot of different ways to make a layer cake. You can choose from any number of different cake styles, bake them in different sizes and shapes, and then there are all sorts of fillings and frostings. Last weekend I had a cup of leftover sour cream sitting in the refrigerator, which was as good an excuse as any to make Ovenly’s Black Chocolate Stout Cake, but I wanted to do something different with it. 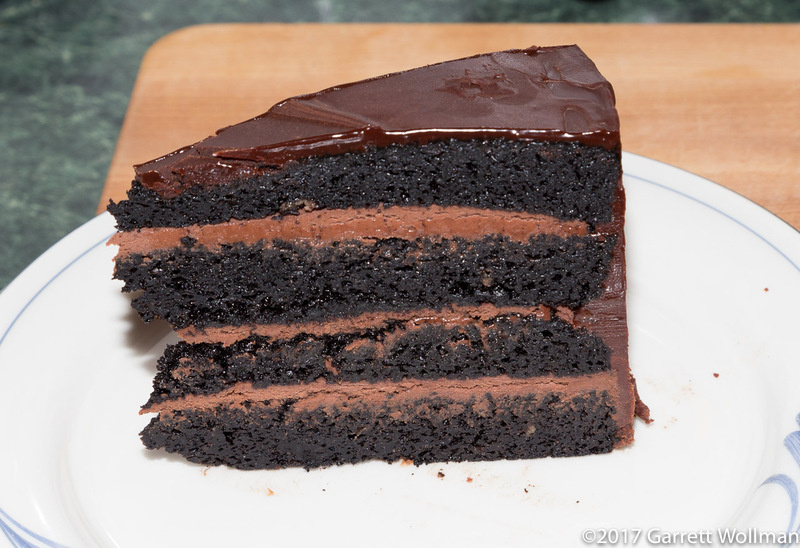 This cake has a strong, bitter chocolate flavor that would clash with most fruit fillings, so the usual route is either to use a lightly-flavored frosting (like the one described in the post linked above), or to double down on the chocolate flavor and make it even more decadent. For the filling, I made Alice Medrich’s whipped chocolate ganache (from Seriously Bitter Sweet , Artisan, 2013; p. 189). I followed the formula for 64% chocolate, to match the block of Valrhona Manjari I was using, although I added a few discs of 63% chocolate to make up the exact 200 g mass specified. This recipe makes 615 g of ganache, after taking a tablespoon or two to taste, which divides nicely by three to fill a four-layer cake. 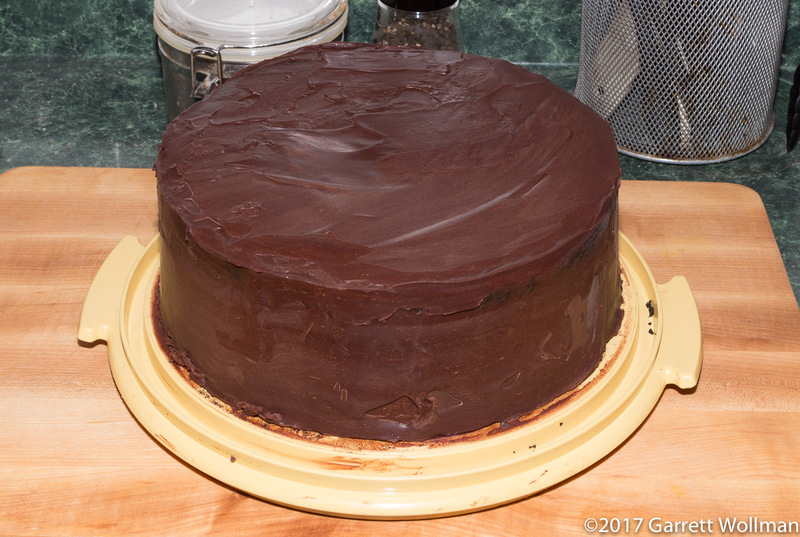 To cover the cake, rather than a traditional buttercream frosting, I used Medrich’s Sara Bernhardt Chocolate Glaze (p. 194), made with Valrhona Guanaja 70% chocolate. This particular combination (of cake, filling, and glaze) is very similar to Medrich’s “Tribute Cake” (p. 171) but for the choice of cake (Medrich’s recipe uses a butter cake with buttermilk and natural cocoa rather than with stout, sour cream, and black cocoa as here). The glaze is very simple, made by melting and then cooling 225 g of your favorite bitter chocolate, 170 g (6 oz or 12 tbl) of unsalted butter, 1 tbl corn syrup, and 5 tsp (25 ml) of water. A nice feature of this glaze is that, if allowed to cool until solid, it can be spread like a frosting to crumb-coat or fill gaps in the cake before reheating it to apply a smooth glaze coating. If I had had some cardboard cake rounds, I would have picked the cake up and tilted it around to get a smooth and even coating of glaze across the entire cake. As it was, I just cut some strips of waxed paper to catch the overflow and spread the liquid glaze over the top and sides with an offset spatula. The ideal temperature for pouring this glaze is 88°–90°F (31°–32°C), according to Medrich, which requires frequent checks with the probe thermometer when reheating. I did the nutrition data for this cake, but I’m not going to copy it out here. Suffice it to say, it’s really bad for you — nearly 800 kcal if you slice it into sixteenths like I did here, with lots of saturated fat and lots of sugar. In general, it’s best to give this cake away rather than eating it. This entry was posted in Food and tagged cake, chocolate cake, chocolate glaze, ganache, recipe. Bookmark the permalink.